These lenses are used to shoot landscapes, panoramic images, and architectural subjects (again, for this last, with resulting straight line deformation). We tested a Tokina very wide-angle lens on Nikon and Canon mounts – the Tokina AT-X 12-24 AF PRO DX Nikon and the Tokina AT-X 12-24 AF PRO DX Canon. 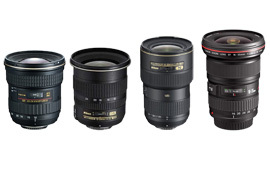 Since their appearance in 2004, these lenses have been joined by some serious competitors: the Canon EF 16-35mm f/2.8L II USM (2007), the Sigma 12-24mm F4.5-5.6 EX DG HSM II Canon (2011), the Nikon AF-S Nikkor 16-35mm f/4G ED VR (2010), and the Sigma 12-24mm f4.5-5.6 EX DG Nikon (2003). A good balance between quality and price. Very good resolution for this type of lens. Very good homogeneity across the field. The lens is a rather heavy. Please note that the comparison were made on an APS-C camera (the Canon 7D), if you own a full frame Canon, here is the comparison on the 1Ds Mark III (without the Tokina which isn’t compliant with full frame cameras). Please note that the comparison were made on an APS-C camera (the Nikon D7000), if you own a full frame Nikon, here is the comparison on the D3X (without the Tokina which isn’t compliant with full frame cameras). Just from looking at the tabled comparisons above, the Tokina appears to have the upper hand, offering good quality for a better price.